You can't trade and invest effectively by using candlestick charts unless you understand candlestick patterns, and you may have a very hard time understanding those patterns if you aren't familiar with basic candlestick construction. Candlestick charting starts with the knowledge of what it takes to make a candlestick and how changes in that basic information impact a candlestick's appearance and what it means. For starters, you need to know what goes into creating a candlestick's wick (the thin vertical line) and its candle (the thick part in the middle). l Price on the open: The price at which a security opens on a given period is the first piece of information used in creating a candlestick. Depending on whether the security's performance is bullish or bearish, the opening price corresponds to either the bottom edge of a candlestick's candle or the top edge. Candlesticks that represent bullish price action appear white on a chart, and candlesticks that represent bearish price action appear black. l High price: The highest price that a security reaches during a given period corresponds to the top of a candlestick's wick. If a security opens at a certain price and then trades consistently lower than that price throughout the period, there won't be any wick at all above the candle. l Low price: The lowest price that a security reaches during a period corresponds to the bottom of a candlestick's wick. If the price action for that period is extremely bullish and prices trade higher than the open, there won't be any wick below the candle. 1 Price on the close: After a security finishes trading during a given period, its closing price is the last piece of information used to create a candlestick. Depending on the security's performance during that period, the closing price can correspond to either the top edge of a candlestick's candle (if the period was bullish) or the bottom edge (if the period was bearish). 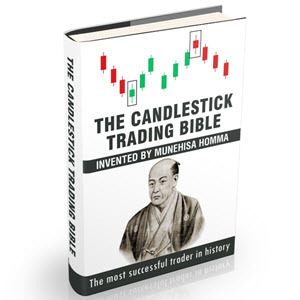 As a true candlestick devotee, I believe that you can gain far more insight into a period's trading by looking at a candlestick than you can by looking at another type of charting tool. Want proof? Take a look at Figure 1-1. Bullish and bearish candlesticks side by side. You can tell right away that the up day has a white candle and the down day has a black candle. That simple difference alone clearly reveals the nature of the price action that took place during that period. In the case of the candlestick with the black candle, there was more selling pressure than desire to buy. And the candlestick with the white candle indicates that there was more buying pressure than desire to sell. Why is this so important? Candlestick charts quickly clue you in on the type of buying and selling that's been going on during a given period and where it may occur again. In many cases, the buyers continue to buy and the sellers continue to sell during subsequent periods or if the price reaches a level that has spurred them to action in the past. For more information on candlestick construction, refer to Chapter 3.